Oddly one of the most perma-bears known in the financial world has become net long. This is not the first time that he has become bullish as I wrote about on Oct 7th. That turned out to be close to the internal bottom of the market on Oct 10th. Peronally I put more faith in a investor like Kass then an academic like Roubini. In this long article on theStreet.com, Kass outlines why the negativity in the markets has become so great that he has become bullish. He still expects the recession to last until Feb '09 making it the second longest on record. I'm still optimistic that the LEI (Leading Indicator Index) will lead us out months before that. Its interesting that he mentions a whole list of stuff that he wants to see before becoming overly bullish, yet not one entails this predictor of the future. 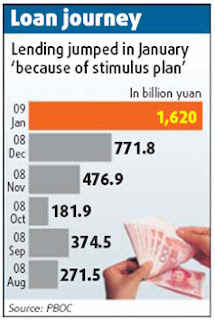 Staggering Credit growth from China as reported by Money Matters in this Seeking Alpha report. A major force for the loan growth, is the economic stimulus plan approved in November that allowed for 30% government funding on infrastructure projects. Hmm... maybe the US should've done something like this. Instead of giving away money to pork projects of specific Congressmen maybe they could've given an incentive to implement valid projects at a discount. The amazing growth in lending has lead to economists actually raising the growth rate for 2009. Now that is shocking and not widely reported in the media. The stock market has been strong lately and such indexes as the BDI have surged off lows. Oddly though, stocks listed on US exchanges such as BIDU, APWR, and FMCN are still hanging around recent lows. While more infrastructure related US stocks such as NUE and SGR have seen big jumps. Having watched the market fall apart the last 16 months, it's no surprise that a small cap tech stock like Anadigics (ANAD) has been hit hard. The amount of the fall might be surprising though considering they have an impressive balance sheet. So many professionals scream on CNBC all day that they want to invest in companies that don't need cash yet stocks like ANAD and another favorite of Stone Fox Capital, Alvarion (ALVR), have fallen to levels that equal cash. Basically the remaining company was valued as worthless. According to the Tulsa World, Carl Icahn and his firm has significantly added to his purchase in Williams Cos (WMB). WMB is now his 5th largest holding according to the article behind the likes of Yahoo (YHOO), Biogen (BIIB), Motorola (MOT), and Anadarko (APC). The investment more then doubled his holdings in WMB to $250M and increased his position to 3%. This isn't necessarily a sign that he plans on being an activist as he held shares back in 2006 that he mostly sold in May of 2008. Seems that maybe Icahn is just a trader in WMB stock, but he might have other plans this time. His more recent investments haven't been that stellar as both YHOO and MOT have bombed since his involvement. Even with the horrible economic environment and a stronger dollar impacting their foriegn operations, Millicom (MICC) continues to post strong growth. Having mobile operations in Latin America, Asia, and Africa does help as the economic malaise isn't as impacting in those countries and the demand for wireless to improve productiviy and provide for basic communications will continue growing. For those willing to look you can still find companies posting 18% revenue growth and 31% EBITDA growth even in this environment. So why is the stock price down 66%? Good question! The results would suggest that the stock would be trading at all time highs. From a technical perspective, MICC looks like it could be breaking out to the upside as its bounced nicely above the 50 ema. We recently purchased more stock in the funds and personal accounts. Looks like good timing considering the 8% rise after the results this AM. Hartford Insurance (HIG) suffered a huge drop after reporting earnings after hours yesterday. The company continues to be hit by losses in it's investment portfolio. Regardless the company guided to roughly $6 in operating income for 2009. Book Value currently stands around $50 as well assuming that most of the bonds they hold rebound as expected. Considering the stock is not far away from trading at $100 these income and book value projections make this stock very appealing at these levels. Its definitely one to trade using a technical perspective as the fundamentals are off the charts, but worst case fears could come true sending the stock back to the lows of $4 or even lower. Closing above $12 looks very solid so an entry point next week above $12 is tempting dependign on how the Stimulous and Bad Bank Plans go. Assuming a positive start, might be time to load the boat on HIG. Or at least thats the word from Dow Jones. Iraq is the process of increasing production of oil to over 6M barrells per day from roughly 1.5M barrells. The complete project is expected to cost over $5B and take several years to complete. This could be one of the mega projects that the FWLT CEO continues to talk about to anybody that will listen. Unfortunately most people in the market have been unwilling to listen to him. Demand for these mega projects that take 3-4 years to complete just isn't eroding. FWLT is a huge buy at these levels and based on the continued strong order flow and backlog. Makes me wonder why the stock even sold off in the beginning. Atwoods (ATW) beat results yet again. Offshore contract drilling remains a strong part of the economy due to long term locked in contracts. As typical with this market, the guidance will be key because ATW does lack locked in contracts for some ships in 09/10. Regardless, ATW along with others I've detailed continue to show how plenty of stocks are still reporting strong numbers. earned net income of $78,363,000 or $1.22 per diluted share, on revenues of $165,504,000 for the quarter ended December 31, 2008 compared to net income of $38,549,000 or $0.60 per diluted share, on revenues of $111,048,000 for the quarter ended December 31, 2007.Atwood Oceanics beats by $0.07, beats on revs (ATW) 16.95 +0.35 : Reports Q1 (Dec) earnings of $1.22 per share, $0.07 better than the First Call consensus of $1.15; revenues rose 49.1% year/year to $165.5 mln vs the $162.9 mln consensus. How to play a company hit by currency impacts when reporting in US Dollars, but still thriving in local currencies. Central European Distribution (CEDC) probably has the biggest impact that I've seen so far. The company is still forecasting as much as 25% growth in Poland and Russia, but due to the significant jumps in the Polish Zloty and Russian Ruble the company has cut 2009 forecasts by 35%. The stock price has crumbled and is now down nearly 90% yet the company still maintains huge growth. Maybe as an investor we should hedge our positions with a currency trade. Or maybe we should just buy on the inevitable rebound. Absent the currency impact this company would report $4 eps for '09 to go along with 25% growth. A good market would pay at least $100 for this stock, but it now trades for nearly $10. Or 4x the lowered estimaets of $2.5-2.80.